Emerald ash borer (EAB), the most destructive forest pest in North America, is present in NH, including in: Belknap, Carroll, Grafton, Hillsborough, Merrimack, Rockingham, and Strafford counties. 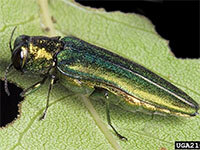 Millions of New Hampshire’s landscape and forest ash trees are at risk from this destructive beetle. EAB’s continued spread in the state will impact residents throughout New Hampshire. Municipalities, homeowners, and landowners are negatively impacted by this pest and will face decisions about management, including potential use of insecticides, removal of EAB-killed trees, and safe disposal of waste ash materials. In forests, ash trees are generally in sensitive riparian areas, so loss of ash from the landscape can impact forest composition and water quality. Additionally, many native insects are highly or exclusively dependent on ash during a part of their life cycle so loss of ash has cascading effects throughout the ecosystem and food webs. The State of New Hampshire’s on-going, multi-agency, EAB response includes detection and monitoring known populations, making science-based recommendations for landowners, recommending use of best management practices for moving potentially infested ash logs and ash firewood, releasing biocontrol agents in an effort to preserve the ash trees of tomorrow, and providing outreach to residents, visitors, and industry about this pest. Those who live, work, and play in New Hampshire can slow the spread of this pest. Natural spread of EAB is slow, taking years to decades. Human activity can move EAB to new areas in a matter of hours. To help protect New Hampshire’s ash trees, report suspect damage or beetles to www.NHBugs.org, consider treating high-value landscape trees with an effective insecticide, and avoid moving the pest in ash logs and firewood. Best management practices and recommendations about emerald ash borer can be found at: www.NHBugs.org. Emerald ash borer is not the only destructive forest pest that can be moved in firewood. Be cognizant that firewood transportation is responsible for repeated introductions of forest pests across the nation. The best practice when it comes to firewood is to: "Buy it where you burn it." For more information, visit NHBugs.